← GBP/USD: Sterling trading a tad lower in the morning session. For the 24 hours to 23:00 GMT, the USD declined 0.73% against the JPY and closed at 110.67. In the Asian session, at GMT0300, the pair is trading at 110.58, with the USD trading 0.08% lower against the JPY from yesterday’s close. 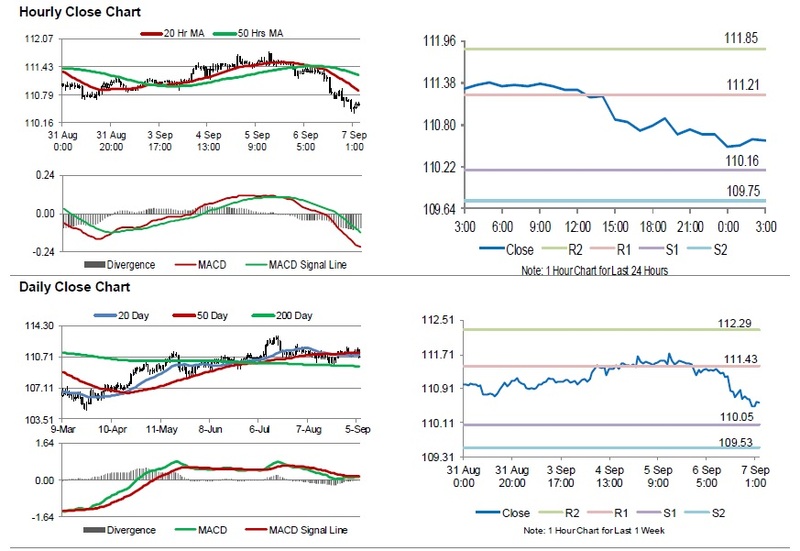 The pair is expected to find support at 110.16, and a fall through could take it to the next support level of 109.75. The pair is expected to find its first resistance at 111.21, and a rise through could take it to the next resistance level of 111.85. Going forward, investors would keep a close watch on Japan’s leading and coincident indices, both for July, set to release in a while.